I decided to play along in the Digital Freebie at Delightful Inspiration to practice my Copic marker skills. 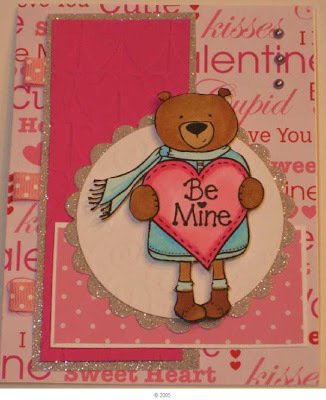 This week's image is a cute Bear holding a heart. The Sketch is for my Bloggers Group Stamps R Us Sketch challenge for December- from Mercy's Blog MTSC50. The sentiment stamp is by Stampendous (Copyright 1997). The ribbon is Offray and the Pearls are by Queen & Co- from blog candy I won last month (thanks Karyn!). End of Year Inventory Blow Out! Help make room for next year’s rubber! Most sets are being discontinued, so don’t delay! All sale sets are priced as marked, and are on the SALE page! How it will work: Week 1 will be 40% off; discount will increase by 10% each week until inventory is gone or December is over! Discount changes every Thursday 40% (Dec 3)- 50% (Dec 10) - 60%(Dec 17) -70%(Dec 24) Off! Discount taken from original prices, and is for IN STOCK ITEMS ONLY! Due to the steep discounts on these items, coupons are not applicable. As of Thursday 12/24 the remaining Sale sets are 70% off! Orders will be processed in the order they are received. The orders will be shipped Jan. 4th or thereafter. Merry Christmas!!! I am posting a tag I made for Tim Holtz 12 tags of Christmas for my Bloggers Challenge Christmas theme this week- this is my husband's favorite tag that I made...... The colors are red and green Ranger Distress ink, and the Distress Embossing Powder is Tea Die Distress EP. The flecks are shimmery- I used Perfect Pearls. On this tag- I followed a tutorial on Shelly Hickox's blog (fellow Technique Junkie) to make the silver flowers- very simple and wow- they look great! I punched the silver fern leaves from metallic silver paper. I had some gorgeous organdy ribbon- it is green with a shimmer of red through it- to finish the tag and I decided to try a technique I have seen on SCS- where you heat your Organdy ribbon- I love the effect. Now, I do not use tags alot, so made a card out of each of the tags I created as well.... 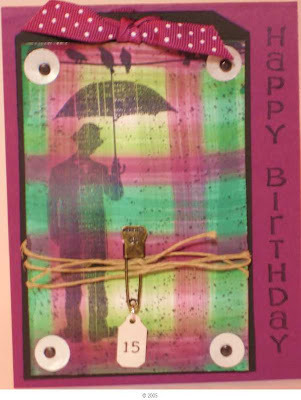 Here is the 2nd tag and the card I created- I made 2 of these. The ribbon treatment is also organdy ribbon with heat applied- this piece shows more of the red tint- it is the same ribbon I used in the tag shown above. The frame stamp is See D's. The Flourish is from ISC, and the Sentiment is from Firecracker Designs by Pamela. I have to say, these tags look alot better IRL! If you left comments on Tim Holtz blog you had a chance to win goodies! There were about 3000 posts a day, so I was not holding my breath.....well, I got really lucky!!! Here is my Blog Candy from the 12 days of tags post! My package arrived Thursday. 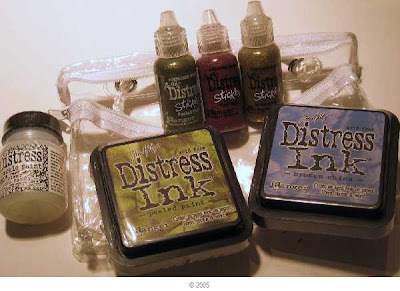 I cannot wait to use the Distress Stickles and I love the Rock Candy Crackle Paint. If you click on the Bloggers Challenge icon on my side bar, you will be directed to links for Bloggers Challenge Participants. I hope you all had a Wonderful time with Family this week and a Blessed Christmas for those of you that celebrate! I printed out the Angel onto Vanilla SU cardstock. I colored the image with Copic markers: R46, R39 then R59; G24, G29, Y21 and then the edges with Y21, E31, E33-picking up colors from my BG paper. 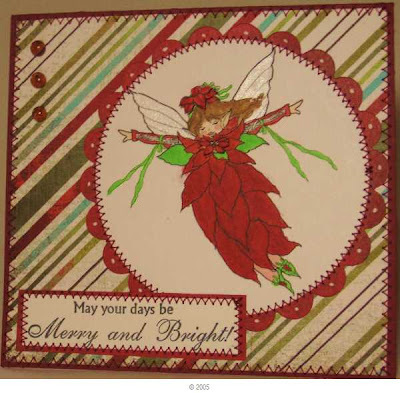 The BG paper is from Joann Fabric- DCWV Holiday Collection. 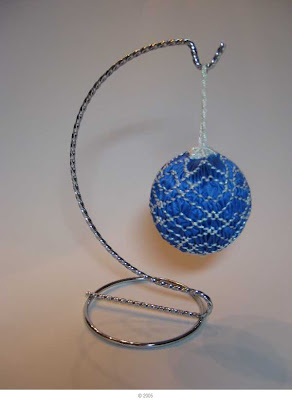 The pattern is from the Technique Junkies latest newsletter and it is called Herringbone. I recycled some ribbon and a large SU brad from a card that was sent to me about month or so ago, and then added some generic Vanilla colored brads to coordinate. I also pierced the Upper Rt corner of the main image piece and below the lettering. The lettering (sentiment) is from a SU set- also recycled from the same card.....I am not sure of the name. I sure hope Nancy does not stop by here before she gets this- but if she does, I think she will like what she see's!!! Have a Wonderful Blessed Christmas if you do celebrate! Oh- I will have to come up with some fun Blog Candy to Celebrate 100 posts!!! Wahoo !!! Our Bloggers challenge this week is a Sketch Challenge. It is a perfect sketch for my card- my family Christmas card. 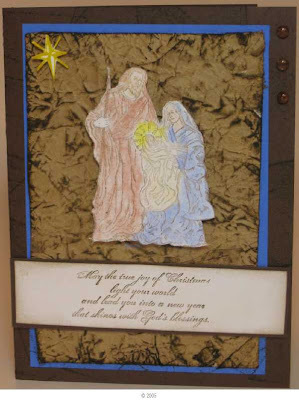 I just HAD to have this Stampin Up set called Holy Family, and I made a dozen of these cards. The card is a little larger than my usual card- 5 1/4 wide x's 7 high . To see the other cards made for the Bloggers Challenge this week- just click the Bloggers Challenge icon on my sidebar- you will not be disappointed! Off to get ready for company- my brother Shawn is coming in from Boston Friday with his son Conner- who is three- I am looking forward to breaking out the Brio Train and the Barney Tapes........ Hahaha Do you think the songs are still the same??? 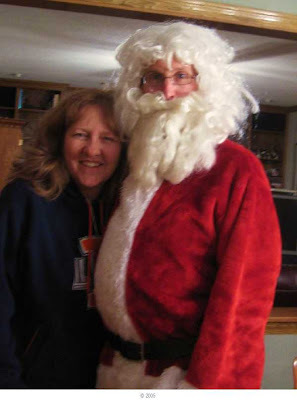 Keeping Warm- and look who came to town and stopped by to say HO Ho HO!!! I should have gone to bed instead of looking at the Sketch Challenge on SCS.........I am going to be sorry today.....I am up late to make this card and am working 12 hours today......Oh Well....I enjoyed every minute of it! I used up the 2nd and last piece of the Herringbone patterned background I made Sunday tonight on my card. I learned this technique from the Technique Junkies Newsletter (which would make an awesome Christmas gift if you do not get the newsletter already!!!) I stamped the gloves from the set Love Never Melts from FCD and then used the sentiment from the set Let's Celebrate from FCD - which is a family favorite (My husband Ray has a really fast metabolism and is always very warm, but his hands are always freezing!) 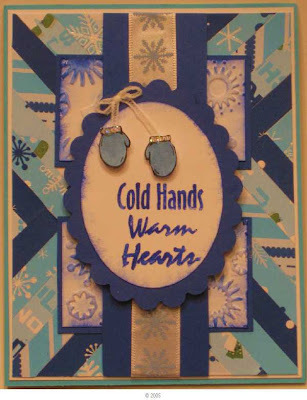 The sentiment is stamped in SU Brilliant Blue, and the gloves colored in SU Blue Bliss- plus I added Ice Stickles to the top of the glove, and a little ribbon to hand them up with. I used the Cuttlebug to emboss the Background strips, and highlighted the embossing with SU Brilliant Blue, then painted on Shimmerz over the top. 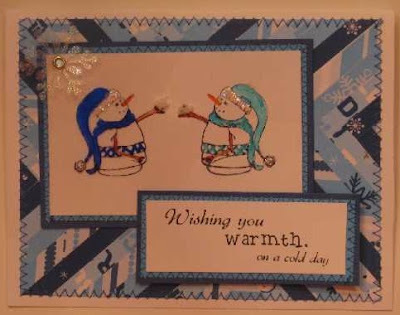 The ribbon is from the Dollar Spot at Target...... Another fun card to make- a fun winter card to give away to a friend. Tonight, Santa stopped by. I told him all of the things I would love for Christmas- most of which are all stamping related. Paper from the Paper Temptress.....a couple of Copic markers, and a book on using Prismacolor Pencils......among other things. I will also be getting alot of stamps from FCD from the Black Friday Sale! Wahoo!!! Santa loves visiting kids in the neighborhood each year at Christmas time, and since we do not have little kids anymore, we find out what all of the HOT toys are.....I never heard of a Shelf Elf.......I will have to look that up- seems almost all of the little kids asked for them. By the way- Pamela at Firecracker Designs is still having her BLOWOUT inventory sale- however, she has taken some time off from the store for the Holidays. You can still order anything in the store-including sale stamps, Flower Soft ETC, and the orders will be processed in the order they are received....but the orders will not be shipped until Jan 4th. This week Thursday, 12/16, the select SALE items at the FCD store are 60% off! Digital images CAN be ordered and will download for you, so you CAN still order them while Pamela is baking cookies, shopping for gifts, wrapping presents, etc. I have a DIGI poinsettia card almost finished to post on Thursday night- it is such a pretty image- THIS LINK will take you to the Digi page at FCD! I love the snow- not the cold.......I love the snowmen that survive the weather after the snowstorms- I have so many fun memories building snowmen with my kids and with my siblings growing up. I decided to make my little snowman in the Snow Shepherd Family stamp set from FCD to have a sibling to have a snowball fight with. I stamped the image on acetate, then turned it over and stamped the image again on the reverse side of the acetate. Viola- partner in crime created! I colored directly on the acetate with Faux Copics (my Bic markers). I added a dot of glue and Polar White Flower Soft (also from FCD) for the snowballs. The DP is from the target Dollar Spot, and I made the design using the Technique Junkies Herringbone Technique from the latest TJ newsletter. I added the snowflake punched with a martha Stewart punch and a piece of acetate. I dabbed on versamark and embossed the snowflake with Irridescent Ice EP. I put stickles on the snowmen hat . I finished off the card by sewing a Zig-Zag around the edges. Our Bloggers Challenge this week is a Happy Birthday card. Perfect to break up the Christmas Card making and a fun way to try something new. 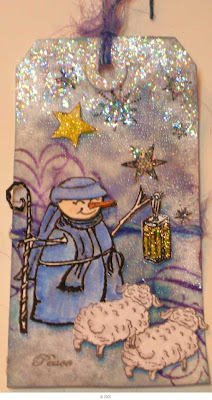 I made a tag-#3 in the series of Tim Holtz 12 Tags of Christmas that he is posting on his blog. I used a variety of alcohol inks, and just dragged them on the felt applicator across Glossy White CS, first up and down, then side to side. I made about 10 of the backgrounds in different colors- and here is the one I settled on to stamp on for my bloggers challenge project. When I made the tags, I decided I was going to make all of them into cards and use them..... Stamps are Stampers Anonymous and the CS and ribbon is SU Rich Razzleberry . Thanks for looking, and please click on the Bloggers Challenge icon on my side bar to see all of the wonderful Birthday card ideas the other bloggers have created! Firecracker Designs is Having a Blow OUT! End of Year Inventory Blow Out! Today Pamela moves to the second week of the blow out sale!! There are stamp sets for less than $5.00 and Flower Soft too! Help make room for next year’s rubber! Most sets are being discontinued, so don’t delay! How it will work: Week 1 will be 40% off; discount will increase by 10% each week until inventory is gone or December is over! Discount changes every Thursday 40% - 50% (Dec 10) - 60% (Dec 17) -70% (Dec 24) Off!! 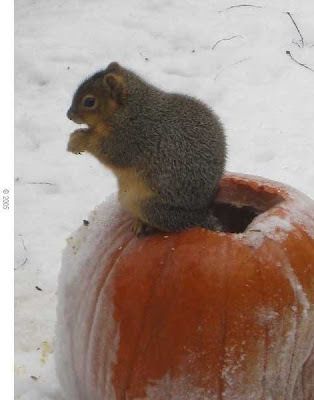 Get `em until they’re gone or until the year is Gone! Don't forget to check out the gift card option; shop, mark the page, give it to your dear significant other, sit back and wait for Christmas! Your stocking will be filled with goodies from Pamela!! Wednesday is Sketch Challenge Day at Splitcoaststampers. I should be either cleaning (boo) or in bed....but, I saw the sketch and have had this card in my head for a while now- and it fits the sketch perfectly, so what the heck..... My son is a HUGE HUGE Brett Favre Fan- despite the fact we live in Chicago Bear country here in the suburbs of Chicago. 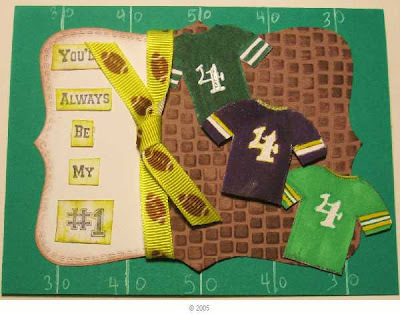 This stamp set by Firecracker designs by Pamela is such a great one for anything football- I stamped the Jersey 3 times, and colored one for each of Favre's teams- Green bay, the Jets and the Vikings. Well, his first ever team was Atlanta, but I decided not to include that jersey. The numbers are from a retured SU alpha/number set-Outline Alphabet.The BG is called Cuttlebug Highlight and it is done on a SU Top Note Die. The ribbon is from Target's Dollar Spot from who knows when. I drew on the Green background with a White Signo Pen for the football field look. End of Year Inventory Blow Out! Help me make room for next year’s rubber! Most sets are being discontinued, so don’t delay! How it will work: Week 1 will be 40% off; discount will increase by 10% each week until inventory is gone or December is over! Discount changes every Thursday 40% - 50% - 60% -70% Off! Get ‘em until they’re gone or until the year is Gone! Discount on IN STOCK ITEMS ONLY! Thanks for stopping by to see my Favre Football card! I wanted to try to make the Tag(s) Tim Holtz is making- 12 Days of Christmas- I started on Day one (12/1)....and have just finished Day one.....yikes- I am a little behind! I decided to try the technique on more than one kind of paper- 1)Manilla Tag (that is what Tim uses), 2) Regular white tag, 3)Top Note Die in Whisper White (SU). I do not know why, but my Manilla Tag looks green not blue- so I threw it out (looks like tornado weather- could not see making anything else with it). Tag #2 was made on a plain White Tag that I rec'd from a Secret Sister swap on SCS. This is the first tag on my blog today. I love the way the Rock Candy Distress Crackle looks IRL- it is a great background and shimmery too. I do not have the stamps Tim was using on his blog so I substituted and used stamps from Firecracker Designs by Pamela. The Shepherd Snowman and sheep are from a new set released this year- I was thrilled- I was wanting to make Christian themed cards- at least for relatives- and I have alot of relatives! The set is called Shepherd Snow Family- you can see it here. The snowflakes are from FCD sets Love Never Melts and Let's Celebrate. The swirl in the BG is from Innovative Stamp Creations set Art4framesII. Pink Elephant- Your Favorite Christmas Color- BLUE! I did not have the Rock Candy Stickles, so used Crystal Ice Stickles and for the star I used yellow stickles also by Ranger on the star and the lantern. I mounted my Top Die Tags onto CS to make a card out of them- used colors from the Bg for the Purple- that is Eggplant Envy (retired SU). For this card, I decided to try Brilliant Blue- too much of the same- so I took a piece of Yo Yo Yellow and did a Technique called Cuttlebug Highlight- that really made the yellow 'pop' on the card. 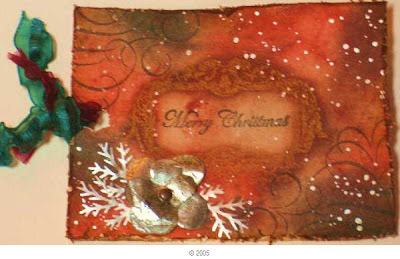 Just in case you have not seen the link to Tim Holtz 12 days of Christmas Tags, here it is on his blog. Dang, I want a job like his! I found this Fairy image-same as in my prior post- on a website by artist Phee McFaddell- intended as a coloring page- look here for the site and to check out her beautiful artwork. My Mother loves Fairies, so I just know she will love this Poinsettia Fairy, so I decided to make her Christmas card with this image. 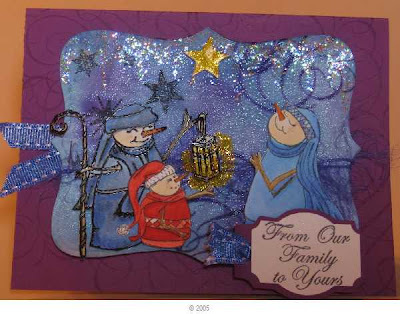 Close-up of the card- can you see the Angel Wings shimmerz on the fairy wings? That is available for purchase from Firecracker Designs by Pamela. You can also see the small poinsettia flowers popped up on dimensionals. 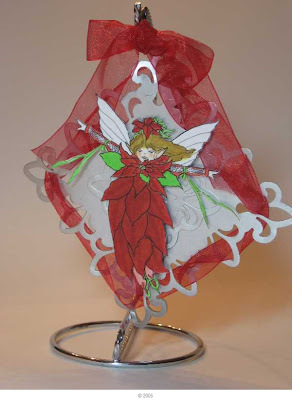 The Copic marker colors are in the next post- I also cut out one of the fairies and made an ornament for my Bloggers Challenge.The DSP is Basic Grey Figgy Pudding. 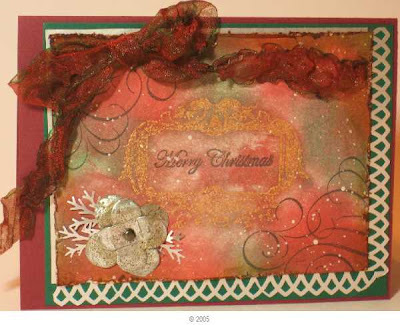 This is a set called Christmas Phrases from Firecracker Designs by Pamela. It has become my go-to set for so many of my cards for Christmas Phrases- and it is so reasonably priced- just $8.99 for all of these wonderful stamps! I hope you are all having Blessed preparations for Christmas and Baby Jesus' Birthday! I found this image on the internet at a website where it is an image- I believe intended for a coloring page. The artist Phee McFaddell has a website where you can view her images- Here is the Link . 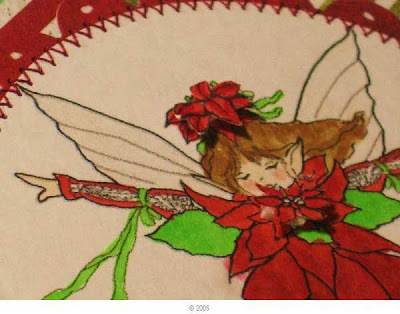 I am not really a fairy person, but like this Poinsettia Fairy- and plan on sending it and a Christmas card I made with the image to my Mother (and Father)- who will absolutely love this! 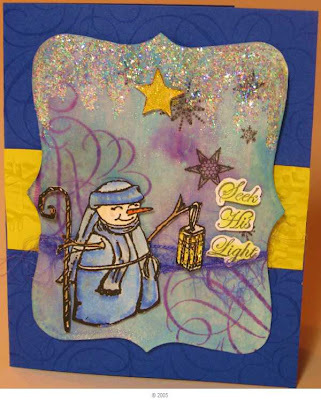 I will post the card later today after errands.......It is up...here is the link to the blog post with the card. 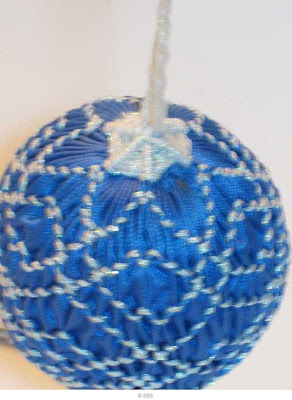 You can click on the Bloggers Challenge Logo on my sidebar to view other Bloggers Christmas Ornament or Holiday Decorations.